(Apr 10) -I am happy to note that the non-profit organization Piedi per la Terra ("Feet for the Earth") continues its program of environmental education for children at the Vineyard of San Martino. The spring program is already underway with some days of a "spring festival" not specifically aimed at children but rather at entire families, sensitizing them to just what a "rural urban community" can be—as expressed in their promo literature: "Spreading the culture of ecology and sustainable living"...[and] "Opening your eyes may take a lifetime, but seeing happens in a heartbeat." contact info: piediperlaterra@gmail.com tel 3385621757 - 3208618957 (both mobile phones). (Apr 13) - ADEX stands for Asian Diving Exposition, the largest diving expo in Asia. It has run successfully for over 20 years and involves lectures, book presentations, films, equipment shows, photography, etc. It is expected to draw over 40,000 visitors to Singapore this year from 15 - 17 April. 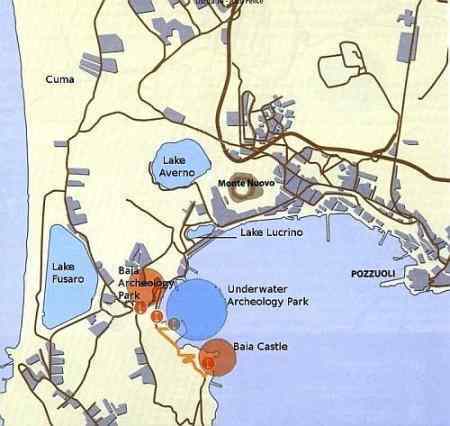 One of the books to be presented is shown (image, right): a guide to the Underwater Archaeological Park of Baia (map, left, larger at this link), a spectacular and little-known (except to SCUBA divers!) display of Roman archaeology. The book will then be released in Naples at the end of this month (ed. Valtrend, Naples). 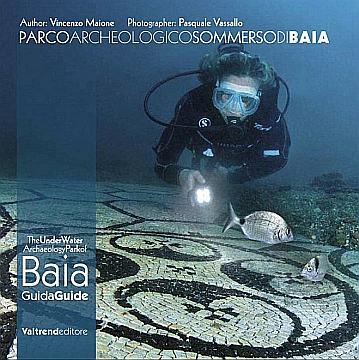 The book is the first of its kind about the underwater archaeology of Baia and is the work of Vincenzo Maione and Pasquale Vassallo. Maione, one of the founding members of the Campi Flegrei Diving Club, has written the text. The club has existed since 1992 and maintains an English-language website. The photography (including the cover shown here) is amazing. Photographer Vassallo is from Naples and has become a widely-known and respected underwater photographer whose work has appeared in publications around the globe. He started on his home turf (surf? ), the Bay of Naples, many years ago and gradually expanded. He has an interest in Asian underwater sites and will give a presentation at ADEX 2016. (Apr 17) - It took some doing, but at last tourists and locals alike finally have a chance to see some of the treasures of Oplontis, the least-known of the Big Three sites destroyed by the eruption of Vesuvius in 79 A.D. (the other two are Pompeii and Herculaneum.) The exhibit is at Palazzo Criscuolo in the town of Torre Annunziata, location of the ruins. On display on the premises of Palazzo Crisculo are 70 items from the ruins. 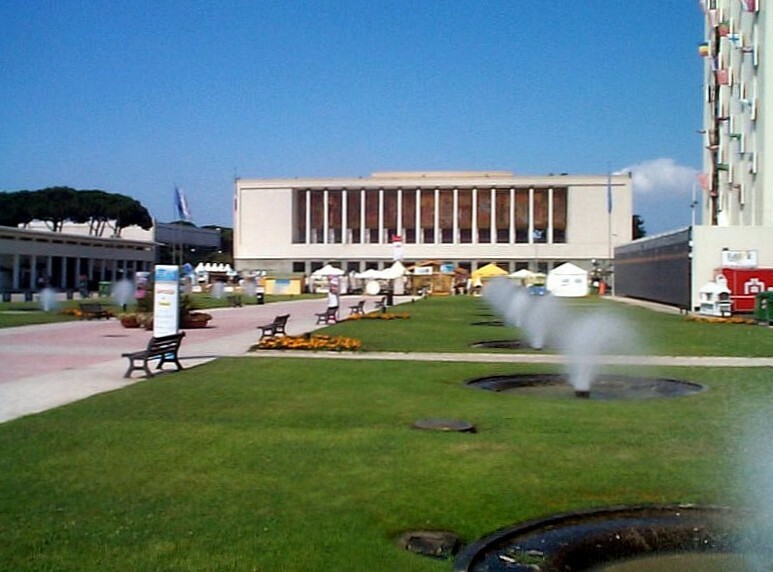 The exhibit is entitled A picco sul mare. Arredi di lusso al tempo di Poppea [roughly, "Looking down at the sea. Luxury in the age of Poppaea."] The exhibit will run into December of this year. The project is part of the ongoing effort to open Oplontis—that is, the physical site, itself—to more and more persons. That plan continues and involves the participation of local high school students in the creation of a virtual reality reconstruction of the entire site that can be delivered to smart phones. (Apr 18) - The term "soundscape" is from the 1960s and means, roughly, the sounds that you hear all around you —your acoustic environment. The sounds may then be recorded, collected and used, as in the case of Napolisoundscape, to build up a sound archive of the city over time. It's intriguing to realize how time-specific some sounds are and how quickly they can change. For example, when is the last time you heard (except in a recording or film) the sound of a steam locomotive? The clicking of a dial telephone? A typewriter? Napolisoundscape is a project started in 2013 at the Electronic Music department of the Conservatory of San Pietro a Majella in Naples; the project was started by Dario Casillo and Christian Sommaiuolo (pictured), both graduates in piano studies at the conservatory. The project was inspired by earlier work of Canadian researcher Murray Schafer at Simon Fraser University, which still maintains the World Soundscape Project. In Naples, researchers are busy recording the changing sounds of speech, the musical cries of street-vendors, the sounds generated in public squares both day and night, the sirens of emergency vehicles, the clip-clop of horses' hooves on cobble-stones, traffic jams, church bells, the shreds of music drifting out onto the street from the practice rooms of the conservatory, the comings and goings at the port, the tiny parish street bands that parade around on weekends —everything you can imagine (the gentleman in the image is recording the soundscape of the new metro station under construction at the port of Naples). It is obviously a never-ending project, and I can think of something they have already missed!— something that will never come again. Thank God. It's the cacophony of 200 teenagers packed onto a ferry boat going to Capri; each one of them is carrying a battery-driven portable 45 rpm phonograph and each one of them is blaring a different song. Digital technology has saved us. Each one of those kids is now locked into his or her own little world of "friends" and silence and that's fine with me. This project to record the sounds of Naples was not helped at all by a local TV presentation telling you to go to "Napolisounscape.com" (sic) for further information. But at least the musicians get it right—the Napolisoundscape people like the guy in the photo. This is the link to their homepage. 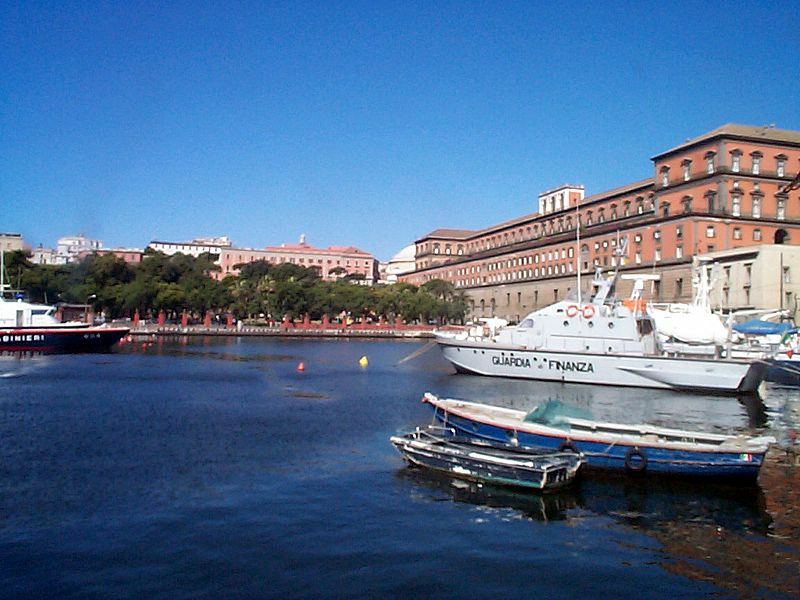 (Apr 26) - photo of the day 1 : This is the small port on the south side of the Royal Palace. It is adjacent to the main commercial port of Naples. This photo is from album 1 at this link. Click on the image (right) for a larger image and link to explanatory text. Naples owns a treasure that projects it into the future like no other Italian metropolis. An artistic-functional system comprised of metro stops which house approximately two hundred works of art created by more than ninety internationally acclaimed artists. 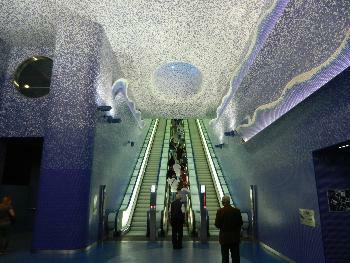 Naples’ metro system, built at the turn of the millennium, is a triumph of international art and architecture and is, rightly so, revered worldwide. The "Toledo", "Università", and "Dante" metro stops are one-of-a-kind museums in which passengers unknowingly become the actual visitors. The video is exceptionally well done and is subtitled in English. It is at this Youtube link. There is a running history of episodes in the building of the Metro since 2002 here. 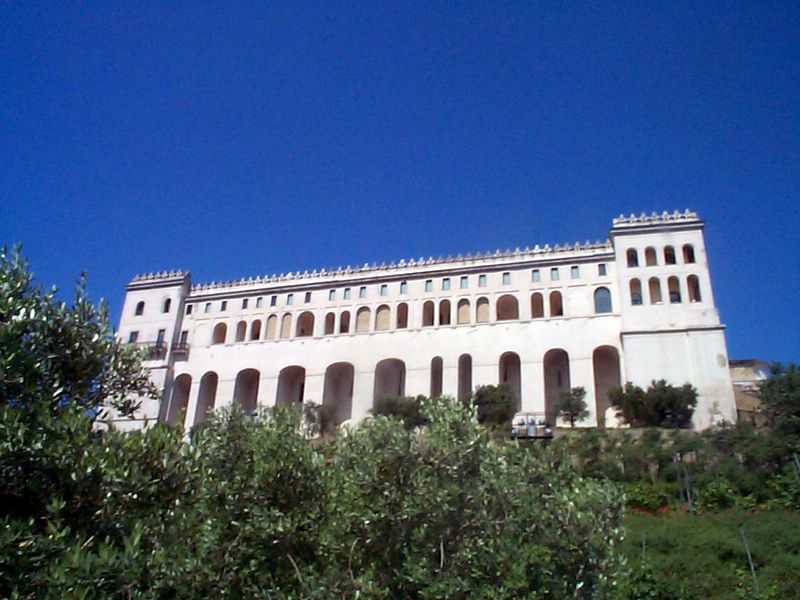 (Apr 27) - photo of the day 2 : This is the San Martino museum that overlooks the city to the south. The photo is shot from the San Martino vineyard and is from album 1 at this link. Click on the image (right) for a larger image and link to explanatory text. (Apr 28) - photo of the day 3 : This is the Mediterranean Theater within the Mostra d'Oltremare (Overseas Fair Grounds) in the Fuorigrotta section of Naples. It is from the 1930s and is a good example of Fascist architecture from that period. The photo is from album 1 at this link. Click on the image (right) for a larger image and link to explanatory text. (Apr 28) - Teaching farms. The image (right) if of the latest addition to the livestock at what is called a fattoria didattica —teaching farm— in the town of Eboli in the Campanian province of Salerno south of Naples. Like you, I thought, Awwww, what a cute little...hmmmmm. Go ahead, guess. (No, don't look ahead. I'll know if you do, believe me. We have a special app for that.) Other than that, the term "teaching farm," I thought, is self-explanatory, but I never realized what an extensive network of them exists throughout Italy. There are more than 1400 farms that teach children (and their parents) what goes on in the world of agriculture. You can look at the animals, see planting and harvesting, make bread, learn how to recognize different plants...pretty much everything you need to know to answer the question, Mommy, where does food come from? It's all part of a relatively recent environmental movement that encourages farms to cooperate with schools in Italy. (It's a llama.) In the Campania region of Italy, of which Naples is the capital, there are 48 such establishments. 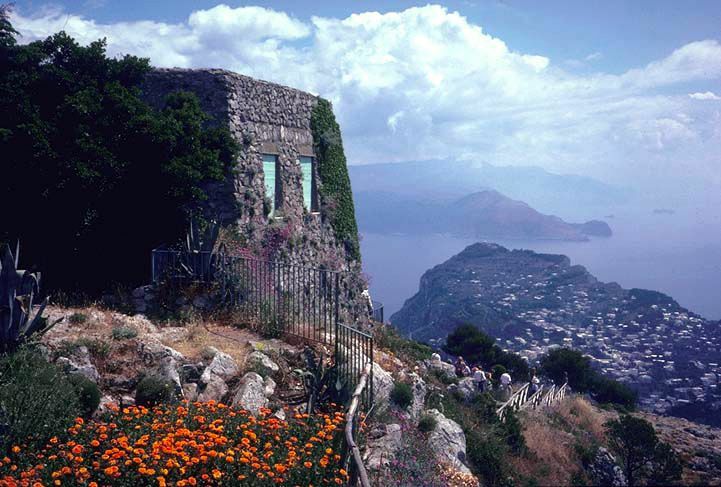 (Apr 29) - photo of the day 4 : This is the view from Monte Solaro, the height at the west end of the isle of Capri. The view is east over the straits that separate the island from the tip of the Sorrentine peninsula. The photo is from album 1 at this link. Click on the image (right) for a larger image and link to explanatory text. 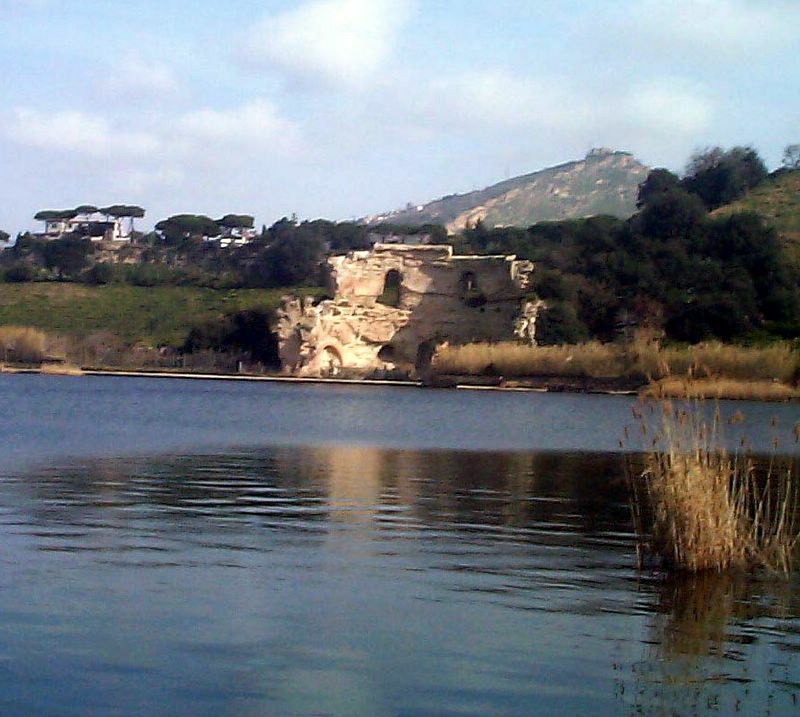 (Apr 29) - photo of the day 5 : This is Lake Avernus (Averno, in Italian) in the Campi Flegrei section of Naples. The lake was an important part of ancient mythology, held to be the descent to the Underworld. (The name, itself, is a cognate of "infernal"). The ruins are of a Roman "Temple of Apollo"; the height in the background is the Gauro volcanic crater. The photo is from album 1 at this link. Click here for a larger image and link to explanatory text. (May 2) - I happily report something that contradicts "The Suez-What?" Syndrome (the perception that the younger generation knows nothing about history =>described here). The good news comes from Salerno, where students from the scientific lyceum (high school) Genovesi-Da Vinci institute, in collaboration with the Italy-Poland Association put on an exhibit to explain the ENIGMA Machine, which as you may know from books and films was the electro-mechanical rotor cipher machine that was famously used by Nazi Germany before and during World War II to encrypt military communications that were then more famously cracked by British cryptographers to disrupt German U-Boot operations in the Atlantic. If you don't know what an electro-mechanical rotor cipher machine is or that the original devices were invented by German engineer Arthur Scherbius at the end of World War I (! ), well you could ask these kids who put on the display. They know about all that. This photo comes from my friends at Napoli Underground. The view is to the south-west from Monte Nuovo in the Flegrean Fields on the Bay of Pozzuoli. The small body of water on the right is Lake Lucrino. (Just out of sight beyond the right-hand border of the photo is Lake Averno.) The group of white buildings across the bay (top center) at water's edge is the town of Baia. The island of Ischia is at the upper right in the background. The flat promontory on the left is Cape Miseno, the end of the Gulf of Naples. This photo plus a complete explanatory text is here. (May 6) - It's not yacht season yet. The bay is empty except for ferries and those uglier than sin cruise ships over at the main port. There was just one luxury superyacht the other day (pictured) moored out in front of the Chiaia seafront near Mergellina— the Symphony, launched last year. She (or He, as female sailors are required to say!) is 101 meters long (! ), built in 2015 by Feadship in Kaag (Netherlands ). Steel hull with an aluminum superstructure, 14.10m (46'3"ft) beam and a 4.10m (13'5"ft) draft. It has room for pools, a cinema, and two motor-boat tenders, neither of which, unsurprisingly, is named for Eugène Pottier or Pierre De Geyter, composers of The Internationale. Owned by Bernard Jean Étienne Arnault, French business magnate, and art collector. He's worth north of $37 billion. He is the 13th richest person in the world and the richest in France. Strange though... the tub didn't show up on marine vessel tracking sites. Maybe this Arnault guy is an alien trying out some electronic cloaking stuff. You know, pop down to Naples for a pack of smokes and no one will be the wiser. Heh-heh. Gotcha, pal. Up periscope. Fire. 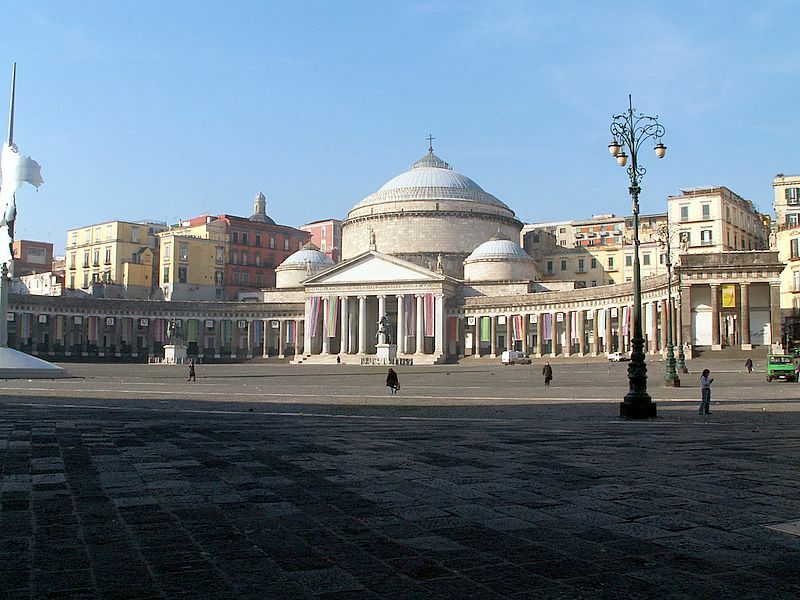 (May 7) - photo of the day 7 - This is the largest open square in Naples, Piazza del Plebiscito. The name of the square commemorates the plebiscite, the public balloting, of October 1860 that ratified the annexation of the recently defeated Bourbon Kingdom of the the Two Sicilies to the Savoy kingdom of Sardinia (alias Piedmont-Sardinia), thus forming the modern nation state of Italy. The photo is taken from the western side of the Royal Palace. The large structure on the other side is the church of San Francesco di Paolo. The photo is from album 1 at this link. Click here for a larger image and link to explanatory text. 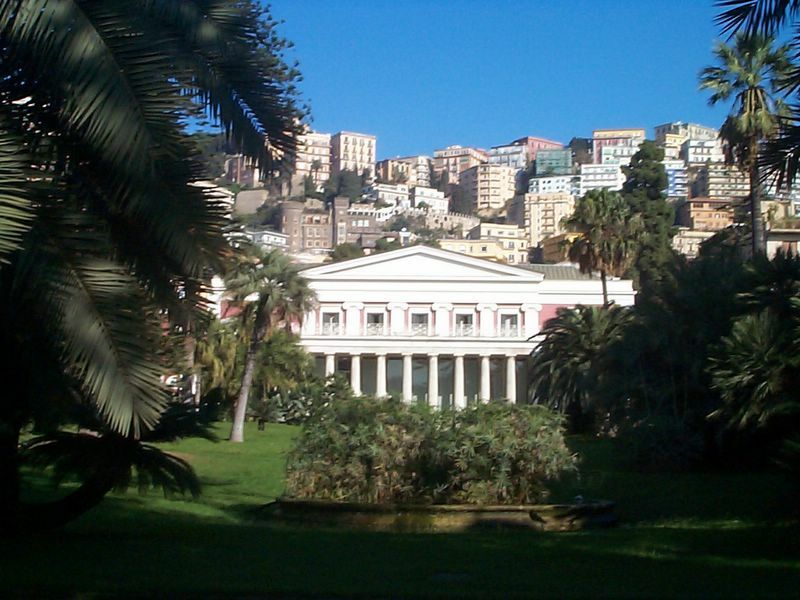 (May 9) -photo of the day 8 - This is the Villa Pignatelli, on the Riviera di Chiaia, the road bounding the north side of the large public park, the Villa Comunale, on the sea front. It was built in 1826 and now houses a coach museum with a collection of French and English vehicles from the 18th and 19th centuries. It is also the site of numerous art shows and has recently undergone restoration. The photo is from album 1 at this link. Click here for a larger image and to link to complete explanatory text. (May 10) - photo of the day 9 - This is an example of the memento mori. In Latin the phrase means "remember you must die." 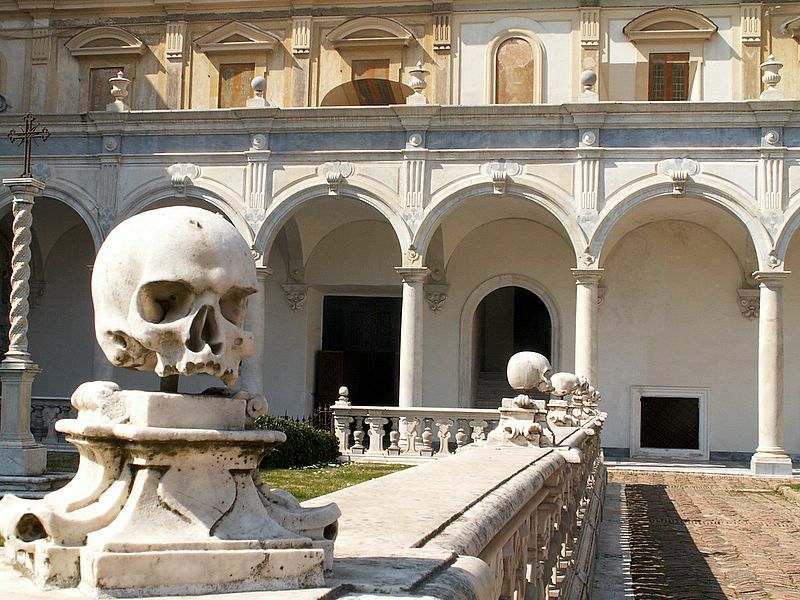 In a Christian context these displays of skulls play a significant part in Neapolitan iconography. They are seen as a reminder to live the kind of life that will be judged worthy. The photo is of the courtyard of the San Martino museum and is from album 1 at this link. Click here for a larger image and to link to complete explanatory text. END of Miscellany page 60. To next page, #61. To previous page, #59.